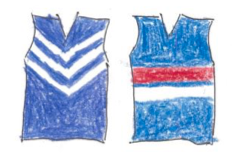 Round 23: Fremantle v Western Bulldogs: Pavlich, He’s Beautiful! I’m quite a number of weeks late, I know. It isn’t easy writing about someone whom has been a major part in your whole life. Ever since I can remember, Matthew Pavlich has been a massive part of my life. From my first ever game of AFL football, in 2006 to his last game in 2016, Matthew Pavlich has always been there. This article will be more so a tribute to Pav than a match report. There are 5 memories that stand out for me. Round 11 2007, Round 6 2008, Round 3 2010, 2nd Elimination Final 2012 & Round 9 2014. Round 11 2007 was my first AFL game at Subiaco Oval. Dad, Grandad and I were sitting in the exact same block as I sit in now as a member. We won. To be homest, I can not remember the game but I had my first exposure to the chant, “PAVLICH, HE’S BEAUTIFUL!”. After the game, Luke McPharlin kicked me a footy too. Geelong came into the 2008 season reigning premiers. In round 6 2008, they played the lowly rated Freo dockers at Subi. Pav kicked 5 goals but it was his final shot that I remember the most. There was less than a minute left and he hit the post. Down at the Subiaco end of the ground, we all thought that he kicked a goal and celebrated like we had stole a win. We had our hearts broken when Geelong kicked the ball out. The siren rang and we were all heart broken. Again, Geelong came into 2010 the reigning premiers. Freo were unbeaten from their first two games and were looking to go 3-0 for the first time ever. What followed was my favourite game of AFL footy. Pavlich took control. He dominated the midfield and he kicked a few goals. We beat Geelong by 7 points and went on to make the finals for the first time since 2006 lead by Pav. In 2012, Freo were a little bit of a surprise in making the finals. Lead by Pav, the Dockers lead another assault on Geelong at the G. Pav kicked 6 goals and Freo beat Geelong by 16 points. One of the best memories of that game is sitting at the pub and Dad txt’d grandad if he was watching the and he replied, ‘too bloody right’. In 2014, Pav became the first WA based player to play 300 games against Geelong (again!). He also kicked his 600th goal with his 2nd kick of the game. It was such a special night to be apart of. Freo will never be the same again. Thanks Pav. Thanks for your article Josh. Wasn’t it a great game (though tinged with sadness for our Beautiful Pav)?! Great piece of writing. As a Bulldog supporter writing about the match I had to acknowledge in the finish that it was fitting to see Fremantle win for Pav’s sake. He was highly regarded as a footballer and as a person throughout the AFL. He reminded me of players such as Brad Johnson and Chris Grant and that is why I was glad to see him go out a winner. It will be interesting to see the Fremantle line-up for next year. Nice work Josh. What a day it was. Now it’s time for you to step up.